I’ve had “Daydream Believer” stuck in my head for the past couple of days. Faced as I am now with the reality that I will never get to have my way with Davy Jones, I have been in a particularly cranky mood this week. 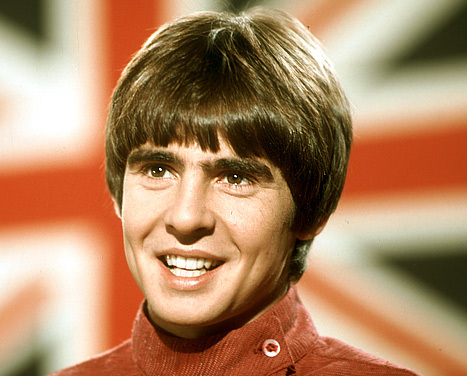 Davy was my first true love. As a child, I wished fervently that my name were Valleri. It didn’t matter to me that Davy was short--he was still taller than me, unsurprisingly, as I was still playing with Barbies. Davy was just so freakin’ cute! He might have had more of an influence on me than I ever consciously realized. Looking back, I wonder if maybe this earliest of infatuations didn’t have some bearing on my preference as an adult for guys with brown eyes and a foreign accent. Eventually, I moved on to Mr. Chekov on Star Trek; my ex is a dark-haired, brown eyed Frenchman and somewhat short of stature. By the time I discovered them, "The Monkees" was in re-runs on Saturday morning as a kid’s show. It was actually kind of a fun little show if a bit surreal at times. In this respect it was fairly typical--many 60’s TV shows were really quite campy. Think "Batman", "Bewitched" & "Gilligan’s Island". At least back then shows were creative. Now all we have is reality TV. In retrospect the Monkees seem rather iconic, though being the made-for-TV band that they were, they were often referred to disparagingly as the Pre-Fab Four. I don’t care; I still like their music. Many of their biggest hits and catchiest tunes (the theme song, "Valleri", "Last Train to Clarksville") were written by Boyce & Hart, but my personal favorites were written by Mike or Mickey. Unfortunately these weren’t particularly big hits and didn’t have much of an afterlife. “Daydream Believer” gets played regularly on oldies radio but if you want to hear “Listen to the Band” you probably have to look it up on YouTube. My favorite Monkees tune is not one on which Davy sings lead. It’s Mickey singing on “Randy Scouse Git”, a most under-appreciated song. The lyrics are worth listening to. By the way, I’ve often wondered if these guys don’t find it rather galling, particularly Mike Nesmith, that they’re still best remembered for something that they did 40 years ago. What a sad week this has been. Good-bye Davy, and thanks. I loved the Monkees - beginning when they were in prime time. They were like the Beatles, at least in my elementary-school mind. My favorite was Micky because he was the drummer, just as my favorite Beatle was Ringo. Plus, Micky was just strange enough to be appealing to me. But of course, Davy had the accent. And Mike was from Dallas (and the son of the woman who invented Liquid Paper). Do you remember why we went to see Peter at a softball field circa 1990? I don't remember the reason, but I have snapshots of his head. Larry, so do I. I guess some things you never grow out of.